Zenescope Entertainment, known for their line of softcore fairy tale comics, offered two exclusive Minimates at SDCC 2014. They were barely announced before the con - people were already on their way when the press release was sent out - and they were both sold separately, in their own little boxes. However, we'll just be reviewing them both at once. Red Riding Hood made her debut in Grimm Fairy Tales #1, but that was before the series began having an overarching storyline (the comic began as standalone stories about people who found their lives vaguely paralleling fairy tales they were reading), so she was just some nameless blonde teenager. Six years later she was brought back for an an arc in GFT: Myths and Legends, where she'd grown up into a psychiatrist named Britney Waters. The Minimate is wearing a costume only slightly less revealing than McFarlane's version. She's got the hood (from "Age of X" Rogue) and cape, but beneath that she's wearing a bustier, a frilly skirt, thigh-high boots, and gloves that appear to cover everything except her hands. She has a painted belt, and laces up the sides of her arms and legs. I can't find any pictures of Red Riding Hood wearing this exact costume, but then, there are limits to what awful things we'll submit ourselves to in the name of research. She's armed with a sword (from Dawn) and an axe, and has a second piece of hair that will only fit if you remove the cape as well as the hood. The second figure is Nissa, who appears to be GFT's version of Tinkerbell with the numbers filed off. 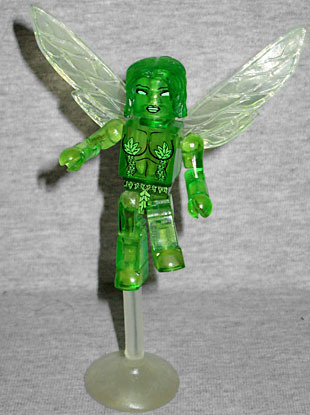 Sure, she's not tiny (well, the Minimate is - like most of them, she's about 2" tall - but the character is the same size as other adult human women in the comic), but she's still a green fairy. This specific figure is translucent green, and has printed leaves preserving her modesty. She has Sin-Eater hair and light green wings. Both these figures include the entirely superfluous disc stands, but Nissa also comes with one of the single-foot hover stands. Her foot is a bit loose on it, though. Just as Tarot: Witch of the Black Cherry has its defenders, there are surely people out there who will tell you Zenescope's output is more nuanced than it seems. But we don't care. 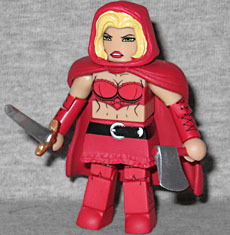 You don't have to know thing one about Grimm Fairy Tales or its many spin-offs to know that this is a cool Minimate of Little Red Riding Hood and a cool Minimate of a little green fairy. The only downside is that Zenescope was charging 10 fricking bucks apiece for each of them! There's no way you should pay that much. They're nice, but wait until there's a sale. This entry was posted in Art Asylum, MMMR, SDCC and tagged Minimates, SDCC 2014. Bookmark the permalink.